mage taken by Wide Angle youth producer Brandon. On Saturday, March 24th, 2018 Wide Angle Youth Media students marched with over 800,000 individuals determined to put an end to gun violence, an issue that that has affected our community and even our schools. Youth from all over the United States shared with the world heartbreaking stories of how they, their friends and families have been victims of gun violence and how it affects them to this day. As someone who lost their brother to gun violence, I understand the challenges we have to go through in order to cope with our losses. Growing up in a Black community, you get used to the idea of people of color dropping like flies because it becomes second nature. The point of protests is so we can end the toe tags, make our community safer, make our schools safer and eliminate the fear of death from the youth’s development. Growing up I wasn’t really worried about gun violence because for some reason everyone grows up with the cliche mindset that “it will never happen me”. We say it like the world revolves around us and our family members, and we are forever protected from the elements, but that changed fast for me. Three years ago we received a phone call that was NEVER expected to be heard. A phone call saying,”Your brother is dead”. At that point, I didn’t know what do, didn’t know what to say, all I know was that I couldn’t move as anger and anxiety rushed through my veins. As soon as I pulled myself together, I was eager to find out what happened to him. I asked what happened and I get a reply saying,” He was shot five times, once in the leg, twice in the stomach, once in the chest, and once in the head”. We need to end gun violence, so innocent people like my brother won’t be left bleeding on the street, so families don’t get that heartbreaking phone call stating that their loved one is dead. Let’s put an end to gun violence. Let’s put an end to the pain and suffering. Let’s make our schools and communities safe. Image taken by Wide Angle youth producer Brandon. 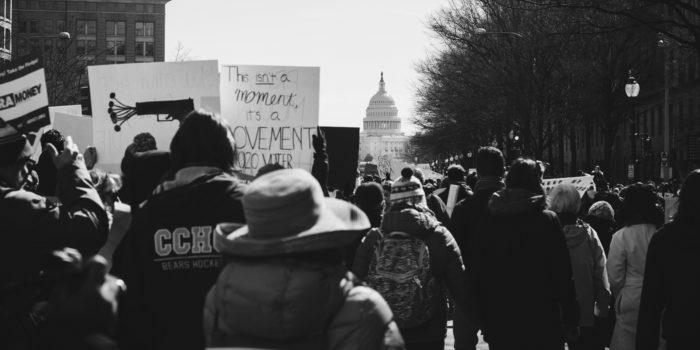 Two days before the March for Our Lives was scheduled to take place in D.C., I heard word that Mayor Pugh would provide buses for 3,000 youth in Baltimore City to attend the march. I thought, “Not. Interested.” Why? Well, throughout history just about every march in Washington has been co-opted, from the original March on Washington in 1963 to the 2017 Women’s March. Putting my thoughts aside, I asked my students if they wanted to meet me at 8 am on the first day of their spring break to attend the March for Our Lives. To my surprise 4 students raised their hands. “Great…,” I thought with full sarcasm intended. But as we walked through the streets of D.C., I felt an overwhelming urge to cry. There were so many people supporting the resilience and courage of youth, and I was glad that my babies (as I lovingly call them) had the opportunity to witness it all. But, those feel good feelings were short lived as young, predominantly white youth standing on the National Archives began to not only talk, but yelled and laughed as Zion Kelly remembered his twin brother, Zaire, whom was shot and killed on his way home from his college prep class. Every time a non-POC child spoke the crowd yelled, clapped, and cheered. But when any child of color spoke, members of the crowd would fidget and talk; their actions alone silenced the voices of black and brown youth. The young people that were with me didn’t seem to share my experience, but on the bus ride back to Baltimore two of the chaperones and I spoke about the clear manifestations of systemic racism that we observed. We felt, simply, that this was not a march for our lives. Watching this behavior reminded me of my childhood. While I didn’t experience gun violence, I am the daughter of a drug addict. I spent the majority of my childhood in drug houses and prison visitation rooms. I witnessed how the crack epidemic ravaged my community. Anyone that walked our streets could tell that the War on Drugs was killing people and destroying families, but no one walked our streets. No one heard our cries. Flash forward, and suddenly the War on Drugs that ravaged my family and childhood, when no one seemed to care, is now a public health crisis? The anger that Black Americans feel as a result of being categorically ignored, silenced, and dehumanized is real and should be acknowledged and validated. The one thing that the March for Our Lives did well was center students of color, who have served as canaries in the proverbial coal mine, and allowed them to speak to the damage gun violence is causing in their communities. The audience may not have listened, but youth of color, even if just in that moment, were heard. While standing with aching knees amidst a sea of white, I heard time and time again the demands of the young activists: keep the NRA out of politics, ban bump stocks, and create safer schools. Feelings aside, what do these solutions have to do with the violence that black and brown children around the nation experience everyday? Nothing. According to my experience and nearly every article and solution that came out of the march, this was just another March for White Lives. People of color and co-conspirators must show up, stand up, change the rhetoric, and focus their energies on changing the systems that prevent the liberation of black and brown children across the nation. I watched news coverage of the Columbine shooting in real time on a TV in class my Senior Year of High School. The entire school was transfixed on the horror of kids murdering other kids with guns en masse at school. We all thought, and some of us voiced, that it could never happen at our school, in our town. We were almost entirely Black and Brown kids and we felt safe from that kind of gun violence. Fast forward to the March For Our Lives almost 2 decades later prompted by another HS gun massacre, my HS still hadn’t had a mass shooting, thankfully. But I stumbled across a profound memories from my youth. Kids from my HS in my small city are all too acquainted with gun violence. The first person I knew who died of gun violence was a kid named Deandre. I met him once in passing in 8th grade. He was a year older than me and died from a gun shot and was found in an abandoned house. My younger brother’s classmate, Michelle, was with her Boyfriend in a car, close to the home of a friend of mine, when they were both shot in the back of the head. She survived and lost an eye. He didn’t. She was in 9th grade. Shortly after HS Graduation a kid who lived on my street, Jaime was out with a few other folks when he was shot in the leg. He didn’t make it to the hospital. He was 18. A young man who was a Senior when I was a Freshman “MuMu” lived on my street. Shot to death in a home invasion robbery a few years ago. On my 16th birthday, my classmate’s Mom shot their Dad and killed herself around the corner from me. I could see their house from my front yard. Kid I played football with, Travis, was shot in the leg afterschool in front of the HS when neighborhood “gangs” had “beef”. He survived. A kid named “Dubee” pulled a gun on another kid before baseball practice. We were 9th graders. I thought I was gonna witness a murder. Dooby never fired the gun. We had practice after that like it was normal. It is NOT normal. The memories of people shot, who shot others and whose lives were impact by gun violence flooded back to me. I talked to old friends and they reminded me of numerous other cases I had buried in my consciousness. My town never had a mass shooting, but like far too many towns, guns violence was, and is, far too common. The March for Our Lives wasn’t just about one tragedy in a place we don’t live, it was a call to action to end gun violence in our High Schools, Churches, Movie Theatres and our Communities. Tragedies that occur with great loss of life and tragedies that scar and maim and traumatize one person at a time must end. As an adult looking back to my foolish younger self’s views on gun violence, I am extremely proud that my daughter, Trinity, is far more wise. She is in the same grade as Michelle and DeAndre when they were shot. Saturday in DC, in a the teeming crowd with Tia, Wide Angle Youth Media and thousands of others, she was marching for her life…and theirs. On March 24, thousands of people, young and old, gathered in cities across the country to speak up about gun violence. I attended the Washington, D.C. march and it certainly lived up to the hype. This was my first time going to a march and I didn’t know what to expect. The schools in the city had been protesting in the weeks leading up to the national rally, but the ones at my school all seemed to be for show. I wanted in on the movement as someone personally affected by gun violence, but I didn’t want to do anything that would be superficial. Eventually, the program started and the voices of young people from all across the country blared from the speakers. It was amazing how even with so many people you could still hear the silence as children bravely shared their stories, but the entire time my mind was racing. As I listened to children tackle the different aspects of gun violence, I thought back to people in my own community, people who feel like inner city neighborhoods have been neglected because gun violence isn’t a new phenomenon for them. The people in my community have been losing loved ones to bullets for decades, but people waited to care until it was suburban white kids getting shot. When little children of color were watching their parents and brothers gunned down by bullets, the media didn’t acknowledge them. To my pleasant surprise, there were quite a few children from inner city neighborhoods who related and were brave enough to call these people out on a national platform, even if they weren’t received as warmly by the predominantly white crowds. After standing all day and listening to speeches and performances around the topic of gun violence, I left feeling an incredible sense of responsibility. All those people got up there and represented their communities, but I was one in a crowd. It was then that I asked myself what I was going to do that separated me from the people that attended only for the story, or to have something to post. What was I going to do to bring my experience back to my community and make a difference? That really is what we should reflect on when we participate in advocacy. I’m going to go back to my community with the intention of making their voices feel heard in every way I can. No matter how you decide to impact your community, you should because if you don’t, who will?